My last blog article, What’s the Magic – The Key That Unlocks Productivity, discussed how people serve as the foundation for all successful productivity efforts. When underutilized, people are identified as the number one waste in lean culture, so it is important businesses balance their concern for people with concern for production. This type of leader lacks direction and control. The result is a work environment that is very relaxed and fun, but production suffers. This type of leader is very autocratic, has strict work rules, policies, and procedures, and views punishment as the most effective means to motivate employees. This type of leader is mostly ineffective. He/she has neither a high regard for creating systems for getting the job done, nor for creating a work environment that is satisfying and motivating. The result is a place of disorganization, dissatisfaction and disharmony. This type of leader settles for average performance and often believes that this is the most anyone can expect. According to Blake and Mouton’s model, this is the pinnacle of managerial style. This type of leader places production needs and the needs of the people equally. When employees are committed to, and have a stake in the organization’s success, their needs and production needs coincide. This creates a team environment, which leads to high satisfaction and motivation and, as a result, high production. 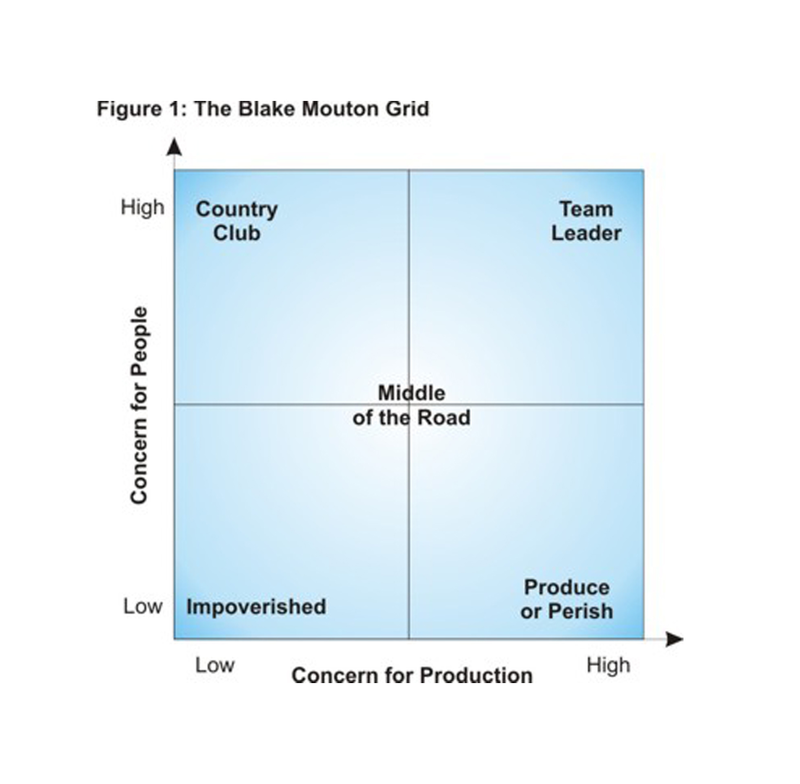 By plotting “concerns for production” against “concerns for people,” The Managerial Grid explains how placing too much emphasis in one area at the expense of the other leads to low overall productivity. Faith Technologies’ innovative productivity program recognizes its people as the most critical ingredient to its success, yet still works to increase productivity by fully engaging the “brainpower” of the experts – our field employees – in our business every day. Other companies must have that same balance to be effective.